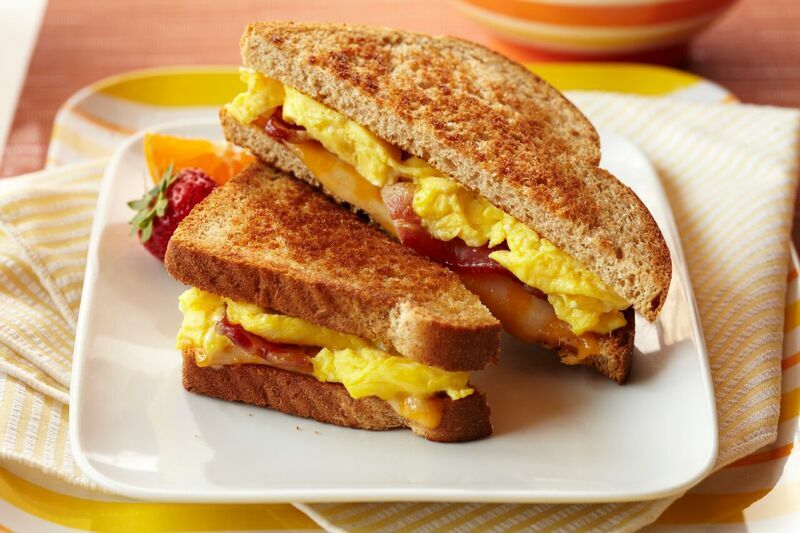 This bacon & egg breakfast grilled cheese is easy and perfect for a go-to breakfast. HEAT 1 tsp. butter in large nonstick skillet over medium heat until hot. POUR IN egg mixture. As eggs begin to set, GENTLY PULL the eggs across the pan with an inverted turner, forming large soft curds. CONTINUE cooking – pulling, lifting and folding eggs – until thickened and no visible liquid egg remains. Do not stir constantly. REMOVE from pan. CLEAN skillet. SPREAD remaining 2 tsp. butter evenly on one side of each bread slice. PLACE 2 slices in skillet, buttered side down. TOP evenly with scrambled eggs, cheese and bacon. COVER with remaining bread, buttered side up. GRILL sandwiches over medium heat, turning once, until bread is toasted and cheese is melted, 2 to 4 minutes. Don't overcook. The heat retained in the pan will continue to cook and firm up the eggs after pan is removed from heat. How long to beat? It's a matter of preference. Light beating produces more dense scrambled eggs. Vigorous beating aerates the eggs, resulting in lighter fluffier curds.